The Detroit Symphony Orchestra tends to play better under guest conductors, and this concert was no exception. Cristian Măcelaru is a bright young conductor who clearly relishes the Romanticism of the music here. Given his experiences with Philadelphia, it's honestly no surprise that he drew a rich string sound, but he was also able to reign in a tricky (read: occasionally unpleasant) brass section. The rest of the orchestra was magnificent on this night, and James Ehnes was his usual excellent self. John Newton Howard is mostly known for his film and television music, and he also has a strong connection to the pop idiom. According to the notes, Howard was so anxious about writing a concerto that he refused to call his piece one until much later in its development. It's clearly influenced by film music to the extent that it has that kind of "sound", but Newton Howard is clearly a capable composer in whatever field he chooses. Some have accused the music of being a touch disconnected, but this is delightfully tonal and extremely accessible music that features a gorgeous slow movement devoted to the late son of conductor Carl St. Clair. 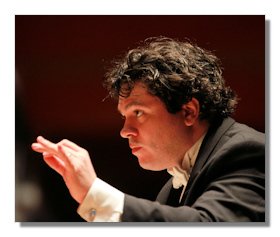 James Ehnes has championed this music throughout the country. Curiously, he chose to have a microphone to combat this talented, but occasionally insensitive orchestra. It paid off, because there were far less issues of balance than have been present lately. The Rachmaninoff was a knockout. Cristian Măcelaru might not be the subtlest interpreter of this music, but it was tremendously exciting and stunningly played. Initially I thought that this might be a string dominated rendition, but Măcelaru integrated the brass into the textures so effectively that the entire orchestra sounded like a cohesive unit. As always, the strings and winds were fabulous, leading to some stunning climaxes throughout. The low strings won the day with some tremendously convincing playing. But again, the brass deserve mention for their careful attention to dynamics and wholly pleasing fortes. Philadelphia – where Cristian Măcelaru works as an assistant conductor – has a long tradition in this music – but so do the Detroit players, who recorded a terrific cycle of the composer's symphonies for Naxos. And it is here that Music Director Leonard Slatkin gets his due. While I tend to write negatively about him, he's nurtured a fine tradition and understands his orchestra's strengths. As the season ends, I also must acknowledge his contributions. Finally, a beautiful but inconsequential reading of the Pavane opened this fine, fine, concert.